There’s a problem with unwanted animals in this city. I’m starting to think there’s a problem with unwanted animals everywhere. In Damascus it was cats, in Sarajevo, dogs. Here in Addis, it’s both. This is a very poor country where people struggle to feed themselves and their children. Some people keep a pet, but it’s easy to see that the additional costs of a litter of kittens or puppies could be unsustainable for a lot of folks. And I don’t know if anyone even does spaying here. I suppose you could find a farmer to neuter a pet animal for you, but no one’s going to do that for free to all the street dogs. I’m sure that many Ethiopians find it hard to understand the soft spot faranji have for animals when there is so much human suffering all around. Charity homes here are full of AIDS orphans and abandoned babies. What kind of crazy person fusses over kittens when children go hungry? It seems such a white western privilege, and a misuse of resources. However, faranji that I am, I can’t accept the cruel methods some people use to rid themselves of unwanted litters. One ICS teaching couple we know found six tiny puppies alive in the dumpster on their way home from school. They brought them to their house, bottle-fed them, and eventually found homes for all but one. Their kids are pretty happy they got to keep that last one. 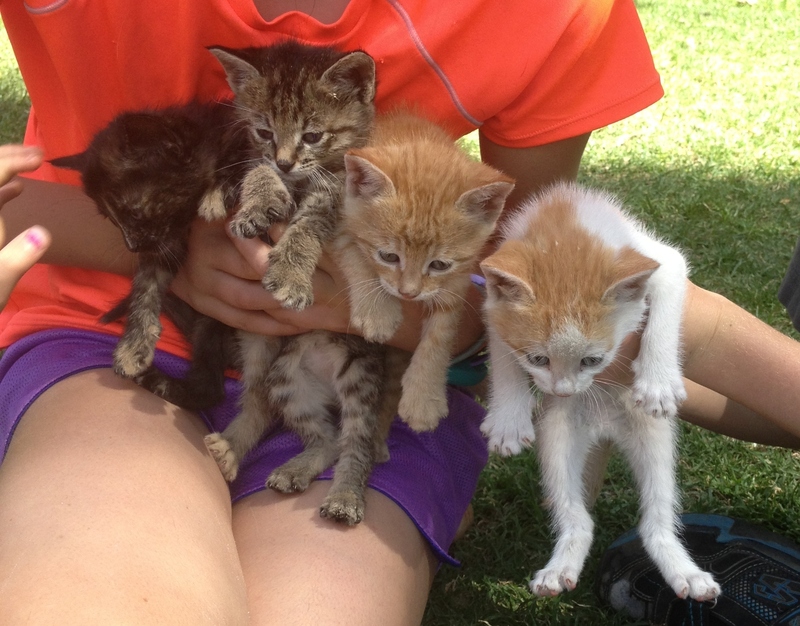 Yesterday morning there was an email to staff from another of our American teachers: someone tossed a bag containing five kittens over the wall into her yard on Friday. Actually, the bag had four kittens in it: the fifth had fallen into a crack between two sections of the wall, where it remained, stuck and terrified, for two days until my friend’s husband devised a means to extract it. I suppose whoever dumped the kittens figured the faranji would take care of them. They were right. Guess what: #2 and #4 in this lineup have just joined our family. This entry was posted in Addis Ababa, Animals, Expat experience, Home life, Sarajevo and tagged cats. Bookmark the permalink. I’d say the US has a long way to go on that one. We may dote on our dogs and cats but we sure turn a blind eye when it comes to meat production. I’d sure rather be a cow or a chicken here than back home. Oh, they are so adorable!!! Yay! I’m already looking forward to their naming and ultimate tales of their future travels and US Customs policies on African bred kitty kats! Yeah, we’ll see how that goes, Nancy. With luck we won’t have to worry about that for another couple of years. Meanwhile, we should be able to figure out if they’re boys or girls in a few days, then we’ll get the name thing settled.